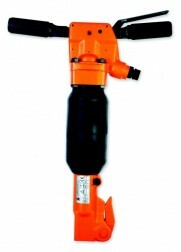 The SRK 17 PE is a medium/heavy, 20.50 kg, paving breaker used in the mining, construction and tunnelling industries. It is suitable for all kinds of digging operations, concrete and rock demolition and asphalt cutting. The SKR 17 PE has antivibration handles, a built in silencer and 8 hour automatic oiler. It used a 22 x 82.5 mm hexagonal steel and has a 19 mm air connection.